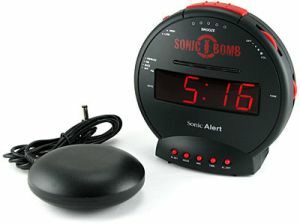 If you are a heavy sleeper then the Sonic Bomb Alarm clock is for you. The clock features an adjustable volume alarm which can shout out at 113 decibels. Like me, you are now wondering what that means. Basically a jackhammer is about 100 decibels. I hope that puts it in to perspective for you. Not only is the sonic bomb a noisy clock, it is actually a shaking clock by the way of a bed shaker which you put under your matress. Having this ultra mean combination of noises and vibrations there is no doubt that this would wake up the heaviest of sleepers.